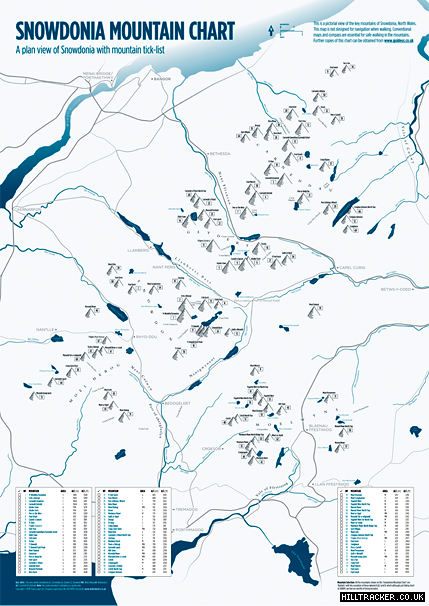 This is a beutiful map of Snowdonia, north Wales. 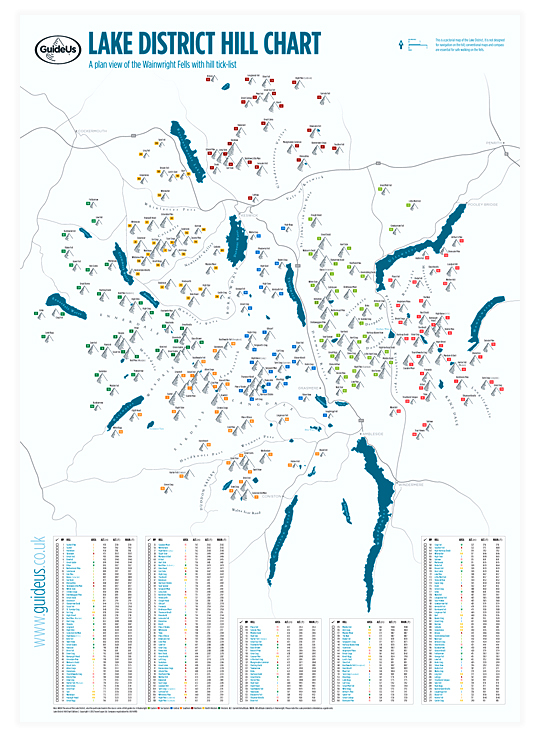 It provides a simplified overview of an otherwise complex landscape. 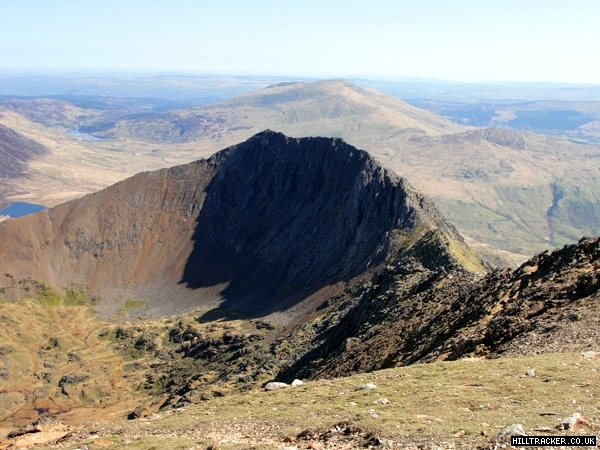 Each key mountain is clearly marked and featured in a Snowdonia mountain tick-list, this enables you to record your progress through these exceptional hills. 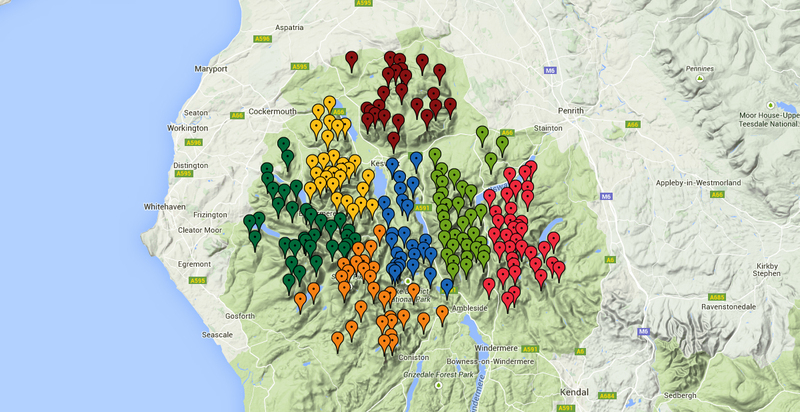 I recently ticked off 6 Snowdonia mountains on my hill chart in one glorious outing! Details and photos below. We’d slept in the Pen-y-Gwrd, the hostelrie with the greatest mountain atmosphere in north wales and so we were in a great position to get to the Pen-y-pass car park before it became full. We winced at the car park charges, paid up, and set off on undoubtedly one of the best walks in Britain, the Snowdon horseshoe. 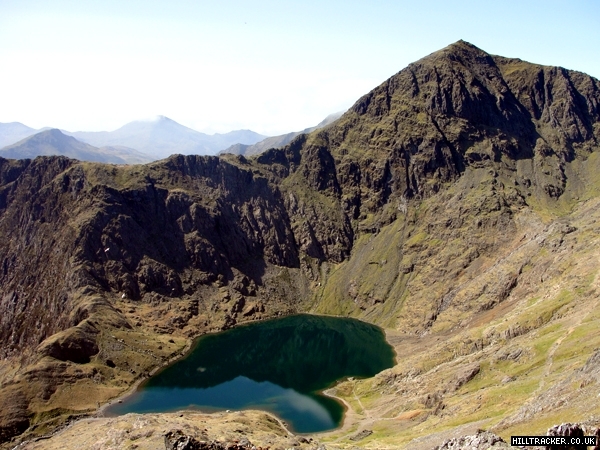 We walked passed the notice warning us that the route we had chosen was extremely dangerous and scrambled up the rocky east ridge of Crib Goch. We knew the route needed care and we gave it the respect and concentration it undoubtedly deserves. Soon we were scrambling across the famous knife-edge arete heading for the rock pinnacles. 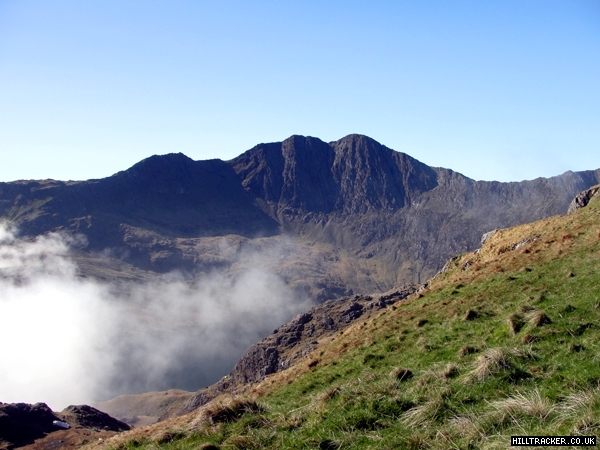 I’d done our route several times and always in the cloud that Crib Goch builds. Today, the weather was perfect and for the first time I actually saw the huge exposure from the arete , looking over the precipitous north face of this splendid hill. Great care indeed , needed, and was taken. We continued the scramble, pleased to be on the ridge instead of on the Pyg-Track-motorway below with the crowds. We crossed Crib Ddysgl and were soon on the summit of Snowdon. The cafe on the top and railway from Llanberis , cannot reduce the magnificence of the mountain …a hill with huge mountain architecture, and today in the sunshine and blue skies we were seeing all its fine ridges, cliffs and lakes. Jack, full of energy, raced off to complete the horseshoe by traversing the fine peaks of Lliwedd. He kept to the cliff edge to savour the marvellous view. I decided I was only up to two thirds of a horseshoe and headed down the Y Gribin ridge, which would eventually lead me via the Miner’s track to our car at the Pen-y-Pass. The ridge I had chosen was new to me and proved a rapid and enjoyable descent. It is most definitely not a walk, but a long rock scramble, with splendid views, which needs to be taken seriously. Soon I was walking across the causeway on Llyn Llydaw, where I was rejoined by Jack who was full of the joys of his traverse of Llewidd. We both agreed we’d had an almost uniquely good day…a cloudless, hot day in april and hence we’d been treated to views of needle sharp clarity with no haze at all. After our brief chat, we slogged back towards the car park, which was about a mile away. Jack was soon over the horizon. I took a more sensible pace, the only one available to me these days. It was a beautiful sunny day in the Lake District and we had the usual problem….should we go walking or do a classic rock-climb? Sean was keen on walking but I pointed out that the sun would have dried out the fine crags high above Buttermere. I won the argument so we packed a rope and headed for the cliffs. We were rusty, so we wanted a friendly crag to climb on, one which shouldn’t be too alarming. So we parked at Gatesgarth farm and trudged up the path by the lake towards Grey Crag, Buttermere. The usual route is into Birkness Combe and up a loose scree tongue to the foot of the crag. We always found this quite a heave and so we avoided it by walking right onto the North East ridge of High Stile where progress was easier. High up we had great views down to Buttermere Lake , and across to the Wainwrights of Robinson and Fleetwith Pike. Further to the right Great Gable was standing proud. We left the ridge and contoured across a boulder field and arrived at the start of our climb, called ‘Suaviter'; a route pioneered by the great Bill Peascod . Rock-climbing is a funny old game . Sometimes you are moving well and sometimes every move is a scary struggle. Today was a good day. The spun coin decided I would lead and I was soon high up on the sharp end of the rope, traversing onto a fine wall of rough rock. Below the wall was nothing, a huge drop. I was learning to respect Bill Peascod, the ex-miner who had discovered and first led this great climb. He had climbed the route with only half of the metal gear that I was jamming into the rockface ….to protect myself should I become airborne . Falling was unlikely. I was moving well and now the sun had come from behind a cloud. Hot dry rock! I hand-jammed my way up a thin crack in the vertical wall . The drop below got bigger and bigger as I got higher and then I came across a ledge. I had finished the route. The climb was over for me , but just starting for Sean , my second. Belayed to my high perch I took in the rope as Sean climbed to join me. I looked down to Buttermere Lake 2000 ft. , shimmering in the sun and I didn’t want to be anywhere else in the world except here on my small perch with the sweep of Lakeland hills all around me. Something moved and I spotted a bird below me with rich brown wings, glowing in the sunlight. It was a kestrel hanging in the air. A common enough sight to anyone walking in the valley, but this time the bird of prey was below me. It is the privilege of the rock climber to share the world of the birds, and often to be above them looking down on them. We climbers and to some extent, fell-walkers , explore and inhabit the third dimension and it is a splendid feeling to be there, up in space….provided all is going well! I heard a shout and it was Sean hollering at me to take in the rope and keep it damn tight. He was starting up the crack over the abyss and finding it ‘interesting’. Rock-climbing is a funny old game and it was Sean’s turn to have an off day. ‘Tight!’ he shouted again. I took in the slack and heard him howl. One of the metal wedges I had inserted into the crack had been pulled out by the tightened rope and had pinged into Sean’s eye! He cursed and explained what had happened . I shouted down that as he now had only one good eye, he wouldn’t be able to see the immense drop below him, and so he would find the climb easier. I told him that really he had an unfair advantage over me. Feet scrabbling on the small holds, Sean joined me on the ledge. He said that the climb was great but he would have preferred to have done it with someone who was interested in prolonging his second-man’s life instead of birdwatching. I said that he had a point. He also had an eye which was blackening nicely. And so the banter continued as we packed our rope and karabiners into our sacks. We left the sacks at the top of the crag and popped onto the summit of High Stile, for the view into remote, wild Ennerdale. Across this valley rose Pillar looking majestic. Swapping more leg-pulls we descended down to Buttermere. Banter was a vital aspect of climbing with Sean. I had to take any opportunity to pull his leg painfully because for sure he would do the same to me . Being Irish he was much better at the cutting, witty put-down than I would ever be. We dumped our heavy rucksacs in the back of the car and drove over Honister Pass, into beautiful Borrowdale. ( Is this Lakeland’s most beautiful valley? I sometimes think it is, but then I sometimes veer towards Wasdale…but then what about the Duddon Valley? There is no answer to the question.) I pointed the car at Skiddaw mountain, for in that direction lay the Pheasant Inn and the essential pint of Jennings Bitter to end a fine day. Soon we were driving past Derwent Water. The sun was setting behind Catbells, turning the lake silver. What a place is the Lake District! Supping one of the best pints in the universe, we did some forward planning. The next classic climb we would tackle would be in Eskdale. Sean , as he wasn’t driving, hit the Jennings and became rather ‘relaxed’ and indeed profound. He said that rock-climbing was essentially mere drug addiction. He explained that we both were hooked on that most powerful cocktail of drugs…adrenalin followed by alcohol. I said that they can’t touch you for it and helped him into the car. We headed north and home, in darkness. 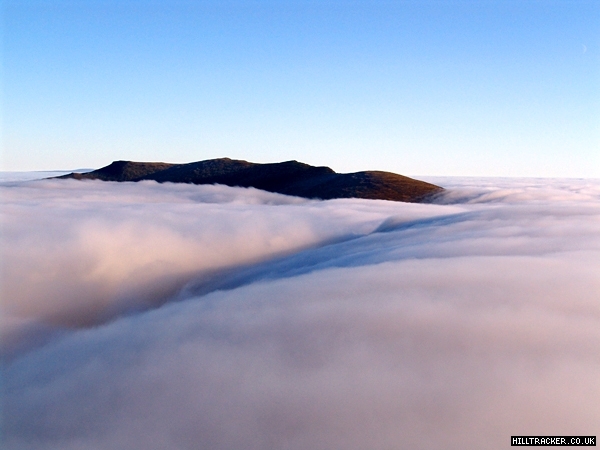 All around me I knew were the perfect Wainwright hills of the Lake District but I couldn’t see them. In the night Sean’s eye would swell and close and the visit to Eskdale was postponed ( but realised a month later ). Instead I accompanied my wife and brother back to the glorious Lake District. They wanted to tick-off Sca Fell ( Sca Fell Pike’s slightly smaller , and better, brother ) to add to their collection of Wainwright summits. Neither of them are rock-climbers but I persuaded them that the only route of ascent for a true Englishman was up Broad Stand, the notorious bad step beyond the Mickeldore col. This short but alarming rock wall is sensibly avoided by most fell walkers. At the crux, we roped up. My companions were on an exposed ledge…two walkers faced with climbing the famous ‘holdless’ wall. Our battle and final success proved to be memorable and hilarious, and the stuff of another Lakeland story.